(2001) "Got Ur Self A..."
"Life, they wonder, can they take me under? Naw, never that." "Life, I wonder, will it take me under? I don't know." 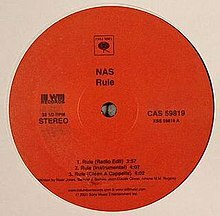 As a single, "Rule" was not heavily promoted, but still reached #67 on the Hot R&B/Hip-Hop Singles & Tracks chart. "Got Ur Self A..." is mistakenly thought to be the first single on Stillmatic because "Rule" was not heavily promoted, did not receive music video treatment and was never released in compact disc format. It was released as a vinyl 12-inch single with "No Idea's Original" as its b-side. It was featured in the 2003 film, Honey, it is also featured on the Like Mike soundtrack, but includes the edited version. This page was last edited on 4 December 2018, at 22:36 (UTC).